Venture Minerals is currently exploring in Western Australia for Copper-Lead-Zinc at the Thor Prospect, Nickel-Cobalt at the Pingaring Project (adjacent and along strike to the Quicksilver Nickel- Cobalt discovery), Nickel-Copper (new target) at the Odin Prospect and Nickel-Copper-Cobalt at the Caesar Project. 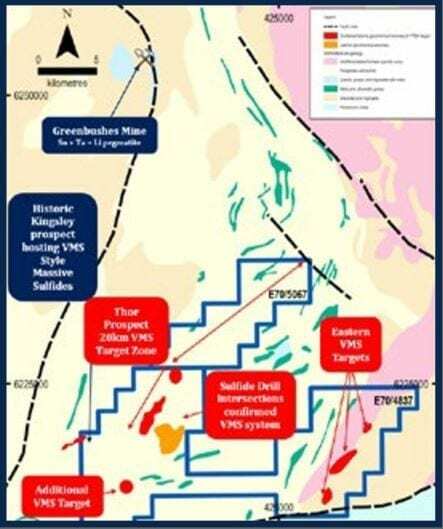 Recently the maiden drilling program at Thor intersected massive sulfides confirming the Copper- Lead-Zinc target is a 20 kilometre Volcanogenic Massive Sulfides (VMS) style system. Thor is now a top priority target for the Company moving forward. 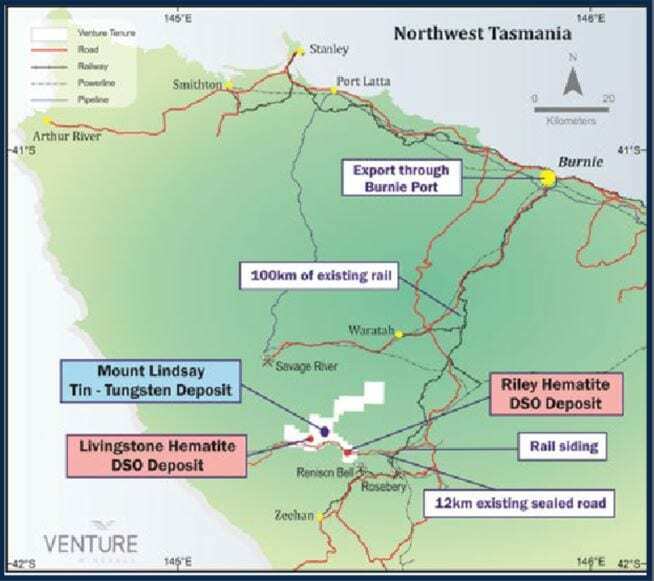 Venture’s initial focus was on realising the full economic potential of the Mount Lindsay Tin- Tungsten Deposit in North-West Tasmania. The Company has already defined one of the world’s largest undeveloped tin deposits and has completed a Feasibility Study on Mount Lindsay. 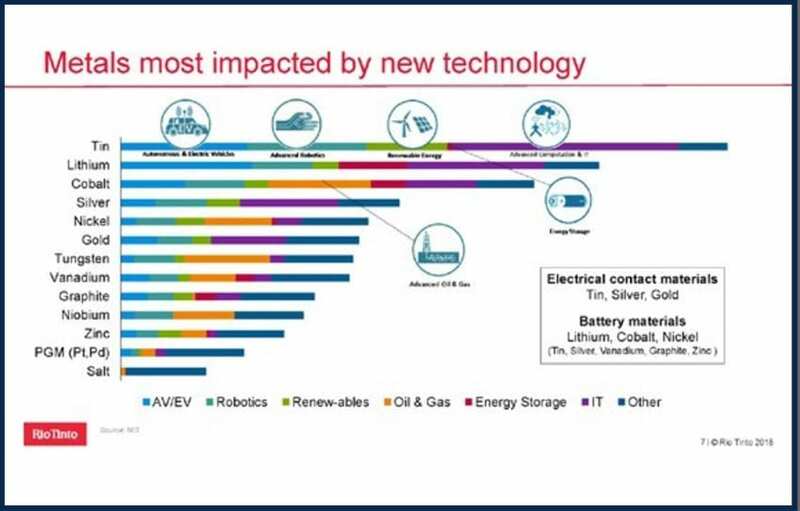 The emergence of tin as the metal most impacted by new technology through its use in Electric Vehicles (EVs) has refocused Venture’s approach to developing this asset and an underground scoping study is currently underway. Venture has commenced several major exploration programs at the recently identified Thor VMS Prospect. The Company’s focus on Thor follows the earlier discovery of massive and semi-massive sulfides in reconnaissance drilling targeting a large historic EM (Electromagnetic) anomaly. In response to high demand from the fast growing EV market, Venture Minerals has commenced a detailed re-assessment of the high grade tin and tungsten resource base at the Mount Lindsay Project . 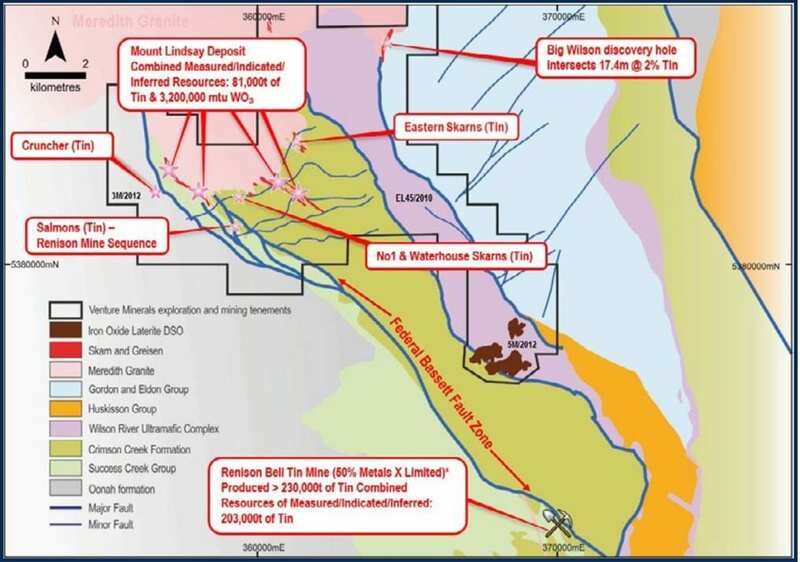 With tin recently being independently ranked as the number one metal most impacted by new technology demand, Venture is uniquely positioned with Mount Lindsay being one of the largest undeveloped tin projects in the world, containing in excess of 80,000 tonnes of tin metal. 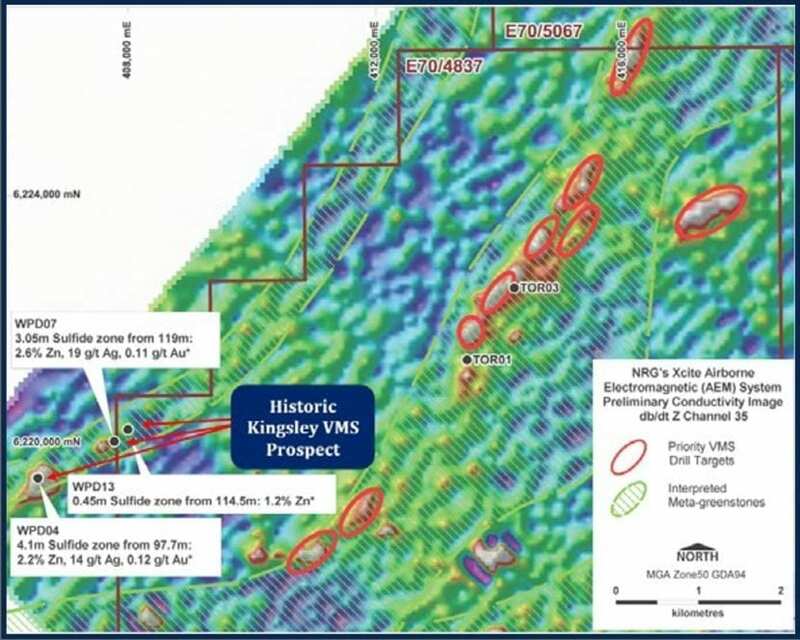 Venture has a large resource base to draw from and intends to look at strategies to optimise the higher grade portions at Mount Lindsay, which previously reported resources included 4.7Mt @ 0.4% Sn & 0.3% WO3 . The company will now look to focus on assessing the underground mining potential of this high grade resource through an Underground Scoping Study that is currently underway. Several High Grade Targets with drill results to follow up including Big Wilson with 17.4m @ 2% tin.